Ex-Guatemalan President Alfonso Portillo, pictured in 2008, is being transferred to Guatemala City after his arrest Tuesday. Ex-Guatemalan President Alfonso Portillo faces money-laundering charges in U.S.
(CNN) -- Ex-Guatemalan President Alfonso Portillo, facing money-laundering charges in the U.S., was captured Tuesday on a farm on the Guatemalan coast, that country's attorney general said. Portillo, who also faces charges in Guatemala and was out on bond at the time of the announcement of his U.S. indictment, was arrested after authorities were tipped to his location, said Amilcar Velasquez. Authorities were transferring him to the Guatemalan capital. The U.S. indictment charges Portillo with embezzling tens of millions of dollars in public funds, "a portion of which he then laundered through bank accounts located, among other places, in the United States and Europe." Portillo allegedly engineered an embezzlement with co-conspirators that occurred from about 2000 through about 2003, the indictment said. Prosecutors allege the money-laundering took place through at least 2006. Portillo was president of Guatemala from 2000 to 2004. Authorities in Guatemala started searching for him after the United States requested his extradition, a spokesman for the International Commission Against Impunity in Guatemala told CNN en Español. Journalist Alexia Rios contributed to this report. 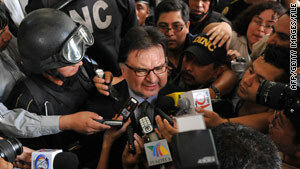 Ex-Guatemalan leader charged in U.S.